Bloggers like me love to see lots of comments on our stories, but too many comments means trouble. Such is the case with my blog on homemade pickles from two summers ago. If you read all fifty comments, two problems become clear: creative cooks are altering recipes (a no-no in pickling), and people with little experience are trying advanced methods, with discouraging results. You can learn plenty from making mistakes, but why take risks with homemade pickles? Here I will discuss the two easiest, nearly fool-proof ways to make pickles: refrigerator pickles and freezer pickles. Both are distinctive and superior in their way. Refrigerator pickles deliver a fresh cucumber crunch you will never get in processed pickles, and making refrigerator pickles will help you understand pickling brines, which are a mix of vinegar, sugar, water and salt. Freezer pickles involve an extra step – pre-salting the cut cucumbers – which is also used in canned pickles. Neither refrigerator nor freezer pickles are cooked, so your kitchen stays cool. Best of all, you can make very small batches. Save up 2 pounds (1 kg) of nicely scrubbed cukes, and you’re ready to make homemade pickles using one of the recipes below. On ingredients, you can use distilled white vinegar, cider vinegar, or any food-grade vinegar labeled as having 5 percent acidity. I use finely ground sea salt, but regular table salt will do. Making refrigerator pickles is a simple matter of mixing up a brine and pouring it over cut cucumbers. These pickles are ready to enjoy starting the day after they are made, and they will keep in the refrigerator for a month. Don’t worry if the liquid does not quite cover the cucumbers at first. Overnight, the cut pieces will release juices that will raise the level of the brine. For sweet refrigerator pickles, make a brine of 1 cup (250 ml) vinegar, one-fourth cup (60 ml) water, one-half cup (100 g) sugar, and 1 teaspoon salt. Heat the mixture just enough to dissolve the sugar. Pour over cut cucumbers, or a mixture of cucumbers and thinly sliced onions. If desired, add a light sprinkling of mustard seeds or red pepper flakes. For refrigerator dill pickles, make a brine of 1 cup (250 ml) vinegar, one-fourth cup (60 ml) water, one-fourth cup (50 g) sugar, and 1 teaspoon salt. Heat the mixture just enough for the sugar to dissolve. Pour over cucumbers, and add 1 teaspoon dill seeds or several dill leaves or flower heads, along with two cloves peeled garlic. Freezer pickles have more pickle flavour compared to refrigerator pickles, and you can eat them for months after they are made. Pre-salting the cut cucumbers is required, but you can experiment freely with flavour accents such as herbs, horseradish, or celery seeds. Sliced onions or peppers also can be added as long as they are included in the pre-salting procedure to enhance their texture. Freezer pickles are a great way to experiment with taste tweaks, too. For example, you can simmer the brine with pickling spices for 10 minutes to introduce another layer of spicy flavours. Before you get started, cut clean cucumbers into uniform pieces and place them in a large bowl. Sprinkle with 2 tablespoons (15 g) salt. Top with six or so ice cubes, and cover with a cloth. After a minimum of 3 hours, or a maximum of 10, drain the cucumbers in a colander and rinse very well with cold water to remove excess salt. Allow to drain while you make the brine. For sweet freezer pickles, make a brine of 1 cup (250 ml) vinegar, one cup (200 g) sugar, and one-fourth cup (60 ml) water. Heat the mixture just enough to dissolve the sugar, unless you want to steep pickling spices in the brine. Cool before pouring over prepared cucumbers. If desired, add a light sprinkling of mustard seeds, celery seeds or red pepper flakes. Pack into freezer containers. Freeze at least a week, and thaw overnight in the refrigerator before serving. For freezer dill pickles, make a brine of 1 cup (250 ml) vinegar, one-fourth cup (50 g) sugar, and one-fourth cup (60 ml) water. Heat the mixture just enough to dissolve the sugar. Pour over cucumbers, and add 1 teaspoon dill seeds or several dill leaves or flower heads, along with two cloves peeled garlic and a light sprinkling of red pepper flakes. Pack into freezer containers. Freeze at least a week, and thaw overnight in the refrigerator before serving. Making a few batches of these easy pickles will teach you so much about basic pickling that you will be ready to move up to canned pickles next time you have a bumper crop. Then again, you may be so happy with your freezer pickles that they become your favorite homemade pickles. "U.K. Pickles are centered on Picled Onions or Shallots, Pickled Red Cabbage, Mixed Pickes incorporating Cauliflower, Mustard Pickles (Picallilli) or Chutneys to use up surpluses. Barbara's recipes sound interesting for using courgettes which grow like weeds. " "Could you just confirm which type of vinegar you are using? is it malt or white vinegar? Thanks"
"Does the type of cucumber matter...pickling, small burpless, etc.?" "Pickling cucumbers are always best because they have better structure, but you can pickle any cucumber, plus many other vegetables. On the vinegar, it's the acidity that matters. Any vinegar diluted to five percent is fine. I generally use white vinegar, or sometimes cider vinegar if I want the amber color." "I like rice vinegar over white which is so sharp in flavor. Any experience with this? Can maple syrup be substituted for sugar?" "In refrigerator and freezer pickles, you can experiment with maple sugar or honey without being concerned about food safety. I like rice vinegar, too, use it often in everyday cooking. It would be an excellent choice here, albeit a bit pricey." "Thanks Barbara... I get my rice vinegar in big glass bottles from the big Asian markets around Los Angeles- much cheaper than at a grocery store with their tiny Asian food sections and tiny bottles!" "I made the two freezer pickles as your directions. The dill are frozen solid ---- the sweet are "slushy" in a zero tem chest freezer. Is the suger acting as an antifreeze?" "Strange, Rick. I can't think of anything that would make the mixture not freeze except not enough time. Hang in there, it will be worth it. I enjoyed some of those freezer sweets on a sandwich yesterday. " " a friend of ours uses grape leaves in making pickles. He claims it gives the pickles an extra crunch. Could this be used for freezer and refrigerator pickles?" "Grape leaves are a very useful ingredient when making salt-fermented pickles, but that's another subject! I think a perfect grape leaf would make a nice addition to a container of frozen pickles. It would soften and darken, and look dramatic in a serving dish. Before using grape leaves in freezer pickles, you may want to blanch them in boiling water for less than 30 seconds. When freezing grape leaves for stuffing later, they are always blanched first." "Hi — very nice metaphors! I teach holistic practitioners how to build their businesses, and I use the idea of the “personal compost pile” quite a lot in reference to life experiences many people would throw away or ignore. When you allow your whole life to be part of who you are now, you obtain quite a wonderful yield from every day! So, like Jillian, I’ll probably borrow the phrase, too because it works on so many levels." "I made these last night. I put the veggies in 6 mason jars, with the brine and spices, then covered them and stuck them in the fridge overnight. When I got up this morning and checked them, the brine was NOT covering all the pickles completely. Is there anyway to save these now? Can I just add more water/brine? Or do I have to discard them all at this point for safety purposes?" "Deb, be patient for now, because the cucumbers will release juice for the first day or so. If they are still not covered with liquid by tonight, add a little more brine. Safety is not an issue because you're keeping the pickles cold rather than canning them. Good luck!" "Do I need to heat the brine or can I just shake until the sugar is dissolved? And can I use braggs organic vinegar to make them? I am trying to get into a more raw diet and pickling would be a great way to preserve certain veggies from my garden this summer. But I am trying to get away from heating as it destroys some nutrients that I need right now for health reasons. " "Judi, for raw food purposes 110 degrees F is still considered raw, and warming the brine enough to dissolve the sugar and then letting it cool a bit should keep you below this temp. Freezer pickles are your best bet because the cucumbers are kept raw. " "Thank you, Barbara, and its ok to use Braggs organic apple cider? I really love it's natural old fashioned flavor. " "I've made 21 day old schoolgirl pickle (recipe passed down through the family). The problem is that I don't have enough juice when I put the pickles in small jars. How can I make the extra pickle juice needed to fill my jars? " "Laura, the usual fix is to mix up more brine exactly like the one in the recipe. For most pickles, this is vinegar and water, with a minimum of fifty percent vinegar (sometimes more)... Judi, with refrig or freezer pickles I think the raw vinegar is fine, but I would use less pricey stuff for canned pickles. " "I understand the importance of using up the refrigerator pickles in a month -but- can I reuse the brine for another batch? How about if I boil it? For how long? Thanks." "Rick, vinegar is inexpensive, so it's hard to make a case for using old bring instead of mixing up a fresh batch. Food safety practices say out with the old, in with the new." "It was all the herbs and spices I wanted to save. Does that make a difference?" "The herbs and spices will lose their punch after a while, so again I would start over. You could strain the old brine, reheat the liquid barely to simmer (to kill microorganisms in the month-old brine), then cool and use as a basis for a nice salad dressing. " "CAN YOU STAND ONE more question??? I love that this pickle discussion has been going on for a year! Could I use the freezer method to pickle green beans?? I suppose would not salt them.. I would love to make a batch. anyone try that? How about little zucchinis?" "Eileen, I think you should experiment with marinated veggie mixes, which are not much different from refrigerator pickles. After a couple of days of marinating, serve them with a drizzle of olive oil. Delicious! " "I made a small batch of the freezer pickles last year and liked them so much that I want to do a larger batch this year. Do I need to increase the salt when I increase the amount of cucumbers? If so, what is the ratio of salt to cucumbers? Thanks for the help." "Lynn, you will need more salt for more cucumbers. I don't measure the salt precisely, but sprinkle it between layers of cut cukes. In general, allow about two tablespoons salt for each quart of cut cucumbers. " "Hello, My family loves Alton Brown's Kinda Sorta Sour pickles recipe. Do you think this type of recipe also work for freezer pickles if I pre-salted the cucumbers first? Thank you! http://www.foodnetwork.com/recipes/alton-brown/kinda-sorta-sours-recipe/index.html"
"As written, this is a refrigerator pickle recipe. To adapt it for the freezer, I would reduce the water by half, then taste test a batch. Presalting would be the next change to try if the freezer pickles were disappointing. If you salted and chilled the sliced cukes for 3 hours or more, these pickles could be canned because the vinegar content is sufficiently high. I would reduce the salt in the brine if you presalt the pickles, lest they come out too salty. " "I don't care for pickles...but I'm making some for my dad because he has cucumbers in his garden...but thank you! This helps"
"Can I reduce the amount of sugar in these? Or does it play a special role that the recipes can't be without? Also, what is the difference in presalting AND brining vs. just pouring the brine on and freezing? " "Shannon, you can slightly reduce the sugar, but then be prepared for a strong vinegar punch. 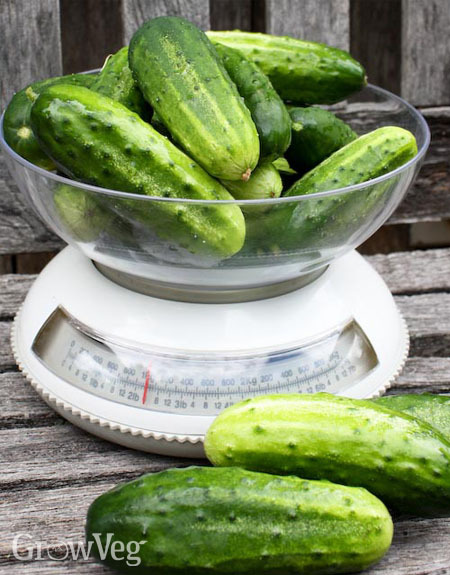 With freezer pickles, presalting removes some of the moisture from the cucumbers which produces a firmer pickle. With refrigerator pickles this step is not necessary. Good luck! " "I only need sweet pickle juice. I use it often in deviled eggs, tuna salad, potato salad, etc. I end up throwing out the pickles and saving the juice. I already have pickling salt, vinegar, and sugar. What else do I need?" "I am completely new to pickling. Do I have to use the mason jars (the ones used for preserving other veggies) or can they be put in any container." "Jennie, This recipe is for a freezer pickle, so you don't have to use regular canning jars. If you're canning with hot brine then you should use the proper mason jars with a new lid every time (though the tightening rings and jars can be reused). Hehe, this sounds like I know a lot about pickling which I DON'T, having only pickled a few times in my life, but this is what I've learned recently :) Peace, Rachel." "Jennie, I think you want a pretty sweet brine. Just mix together 1 cup sugar, 1 cup vinegar and 1 tablespoon salt. If it's too strong, you can add up to a cup of water. I would keep the mixture in the refrigerator. Good luck!" "Can use whole and/or spears for your freezer pickles? Thank you!" "Pamela, I would only use whole cucumbers for freezer pickles if they are very small. Spears or long slices are great!" "Can I use 0 sugar, or artificial sweetner? I don't consume any sugar of any kind." "Toni, I'm diabetic so I try to avoid sugar, too. I've found that all the artificial sweeteners, even stevia powder give the pickles a strange aftertaste that isn't tolerable at all. So what I've done is to use a mix of about 60% stevia powder and 40% sugar whi8ch seems to work ok but no sugar won't work." "hello , your recipes do not say how many cukes for the pickles / jerry / ohio"
"About 2 pounds (1 kg) of cucumbers is about right for the brine amounts here. Good luck!" "What would be the spices and other ingredients to use to make bread and butter pickles to freeze ?" "Connie, you can follow the recipe for sweet freezer pickles above, and reduce the sugar and vinegar by half. Include a sprinkling of mustard seeds and some finely sliced onions, and you should get a refreshing version of freezer bread and butter pickles. You can play with flavors all you like, because the food safety guidelines for canned pickled don't apply to freezer pickles. "